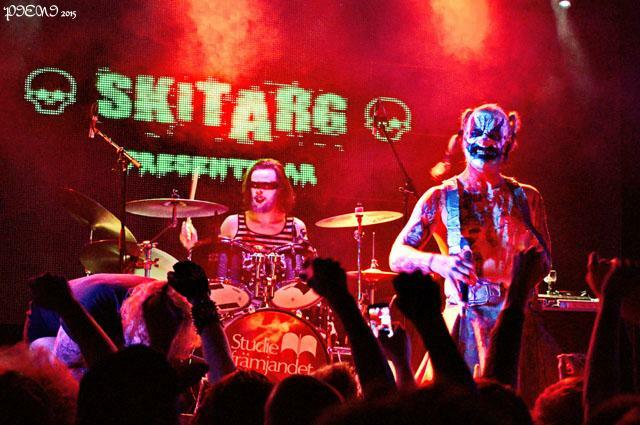 Clown metal is a big thing in Sweden, at least when it comes down to SKITARG. The house had been crowded for both supporting acts, but for SKITARG it was fully packed, leaving no doubt that they lived up to their headlining status. Sure, their creepy-clown makeup and flashy outfits cause an impressive visual impact, but if we strip those away, we’re still left with a very active and crazy, powerful performance. So if you’re thinking that SKITARG’s popularity is only due to their looks, think again. And songs such as “Jag Bryter Nacken Av Din Häst”, “Du Har Keps Och Knarkar” or “Utvecklingsstörd” made the crowd go wild in mosh circles and loud sing-alongs, proving my point. At some point, close to the end, THE END OF GRACE-Kriss joined on stage, not to sing but just to fool around with Barnet. Sadly I had already put away the camera, as the aforementioned mosh was too vicious for my bones’ sake and I had retreated to a safe point at the back. Yeah, it was that kind of show, that kind of party. This entry was posted in Concerts and tagged clown metal, clowns, creepy, göteborg, Gothenburg, metal, nemis gbg, Skitarg, Sticky Fingers. Bookmark the permalink.